St Kevin’s Way is a 30 Km (18 mile) trail from Hollywood, following in the footsteps of St. Kevin through the hills of Co. Wicklow to the haunting and mysterious valley of Glendalough where he spent the rest of his life in solitary prayer and contemplation. After Kevin’s death in AD 618, what had been a humble hermit’s retreat developed into an impressive monastic city which was to continue as a centre of piety and learning for many years to come. Medieval pilgrims came from far and wide to visit Kevin’s tomb, and the alternative starting points to the walk reflect the different directions from which they are likely to have travelled. The main route starts in Hollywood, while the alternative route comes from Valleymount. The paths meet and join at Ballinagee Bridge. The walker then climbs towards the spectacular Wicklow Gap, a classic example of a ‘wind gap’ and the highest point on the route. The flagstones of the old pilgrimage road are still visible in sections. 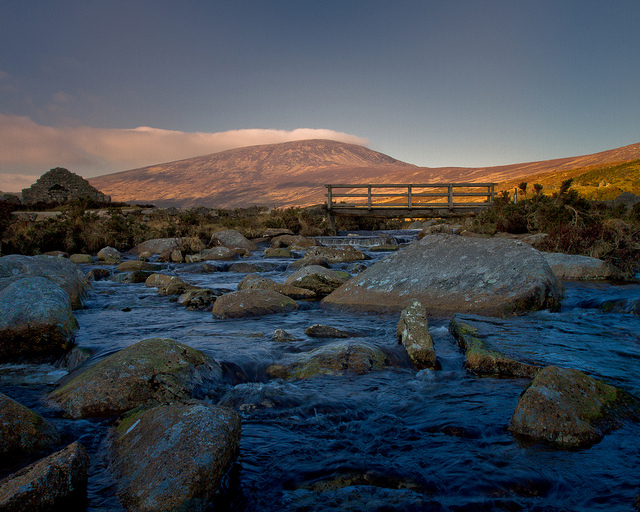 The route then follows the descent of the Glendasan River into the Valley of Glendalough. Before proceeding to the monastic buildings, a visit to the fine interpretative centre beside Glendalough carpark will give an overview of the history of the area. Little remains of the early monastery that grew up around St Kevin’s tomb, and most of the monastic buildings date from the eleventh and twelfth centuries, the heyday of the European pilgrimage. The cluster includes one of the country’s best preserved examples of a round tower. The valley beyond the monastic settlement has much to offer, including a view of the inaccessible ‘St Kevin’s Bed’ from which he reputedly hurled a seductive maiden into the lake below in a determined effort to preserve his chastity. Please note there is an alternative start point for this walk commencing from outside the Catholic Church in Valleymount, Co Wicklow. This joins the main route from Hollywood at Ballinagee Bridge.